Goodreads says, "Lina is spending the summer in Tuscany, but she isn’t in the mood for Italy’s famous sunshine and fairy-tale landscape. She’s only there because it was her mother’s dying wish that she get to know her father. But what kind of father isn’t around for sixteen years? All Lina wants to do is get back home. But then Lina is given a journal that her mom had kept when she lived in Italy. Suddenly Lina’s uncovering a magical world of secret romances, art, and hidden bakeries. A world that inspires Lina, along with the ever-so-charming Ren, to follow in her mother’s footsteps and unearth a secret that has been kept from Lina for far too long. It’s a secret that will change everything she knew about her mother, her father—and even herself. People come to Italy for love and gelato, someone tells her, but sometimes they discover much more." Sixteen year old Lina's world is turned upside down when her mother dies from cancer. Her mother makes Lina promise that she will spend the summer with her father in Italy. This sounds ideal, but she has never even met her father and he works at a WWII cemetery.... not exactly the Italian location she had in mind. As she gets to know her father, Howard, she realizes that maybe he isn't too bad and Lina actually starts to enjoy her time in Italy. Plus, she comes across her mother's old journal and as Lina is starting to heal, she finds herself flipping the pages learning more about her mother's stay in Italy. Thanks to her new friend/possible love interest, Ren, she is starting to fall in love with Italy. The architecture, the food, the romance, the gelato...it's all turning out to be a gorgeous summer. Except there are secrets her mother never told her and she is determined to figure them out. 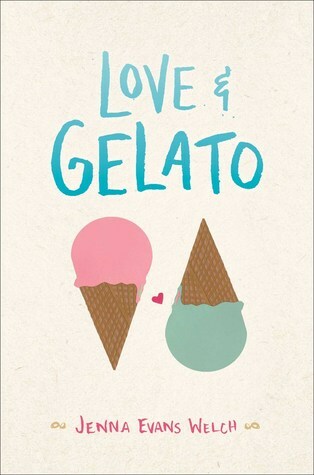 Jenna Evans Welch's debut, Love & Gelato, is the perfect kind of beach read for those who have a serious case of wanderlust. Lina is an interesting character in Love & Gelato. I can't say I was overly invested in her, but I was interested in her finding out exactly what her mother was hiding. One of my favorite aspects of the novel was her mother's journal. Her mother was a photography student in Florence and Welch gives us snippets of her journal. It was a nice addition to the story, especially as Lina tries to piece together the truth. Obviously the best part of Love & Gelato is the setting. Tuscany. Florence. Rome. *sigh* This book had me longing to go back to Italy and explore the cobblestone streets, eat some amazing food, check out the sights...Welch did a fantastic job bringing it all to life. I read that she lived in Florence for quite sometime and that is evident in Love & Gelato. Although the romance was just ok for me, I still liked the whole fish out of water concept and the idea of meeting a cute boy to show you around an exotic location. There were definitely some ups and downs in Lina's relationship with Ren and plus, there's a hot Brit as well! Love & Gelato felt a bit young to me at times, but nonetheless, I enjoyed my "visit' to Italy. 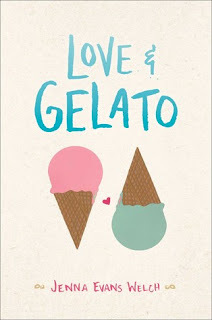 If you love to armchair travel, you should definitely check out Love & Gelato this summer. You'll be craving gelato by the novel's end and planning your escape to sunny Tuscany. The premise reminds me of Sophomore Year is Greek to Me which I also liked. I hear you! I feel the same way and yes, very similar to Sophomore Year! Thanks for visiting, Christina! This is definitely going to make me want to go back to Italy as well Christina! Florence was my favorite city, so I'm glad it really feels like you're there:) I'm a little bummed this one reads young, I tend to struggle with those types of reads, but I'm not sure I can pass up the Italy part! The Italy part is so worth it, Jenny! I can't wait to hear your thoughts. Thanks for dropping by! I love your description of the mother's journal; that would be a great read all by itself, right? Thanks for sharing this one, Christina! Me too! I loved that part of the book. Thanks for visiting, Tara! Great read for someone who hasn't been to Italy. :) On my list! I hear you!! It's a magical place for sure. Thanks for visiting, Joy!